Located near Keystone, South Dakota, Mount Rushmore National Monument is a memorial that was designed to celebrate the first 150 years of U.S. history. The memorial consist of sculptures of of four American Presidents: George Washington, Thomas Jefferson, Abraham Lincoln and Theodore Roosevelt. With Moon Mount Rushmore & The Black Hills, you can plan your trip your way. Craving more of the great outdoors? Check out Moon Zion & Bryce or Moon Yellowstone & Grand Teton. For full coverage of America's national parks, check out Moon USA National Parks: The Complete Guide to All 59 National Parks. The first book to tell the complete story of Rushmore. Now in paperback, The Carving of Mount Rushmore tells the complete story of the largest and certainly the most spectacular sculpture in existence. More than 60 black-and-white photographs offer unique views of this gargantuan effort, and author Rex Alan Smith—a man born and raised within sight of Rushmore—recounts with the sensitivity of a native son the ongoing struggles of sculptor Gutzon Borglum and his workers. Did you know that it took more than fourteen years to carve Mount Rushmore? Why were Washington, Jefferson, Teddy Roosevelt, and Lincoln chosen to be carved? Memorializing the first one hundred and fifty years of American history, Mount Rushmore stands as a symbol of the men and women who helped shape America. 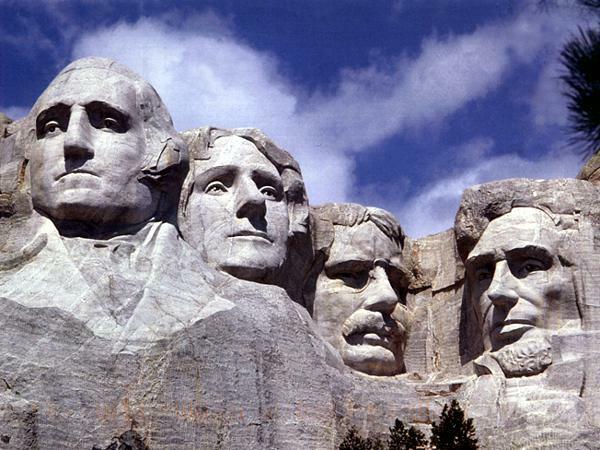 It was world-famous sculptor Gutzon Borglum's dream to carve sixty-foot-high likenesses of four presidents on a granite cliff in South Dakota. Does that sound like a wacky idea? Many at the time thought so. Borglum faced a lot of opposition and problems at every turn; the blasting and carving carried out through the years of the Great Depression when funding for anything was hard to come by. Yet Mount Rushmore now draws almost three million visitors to the Black Hills every year. This is an entertaining chronicle of one man's magnificent obsession, which even today sparks controversy. A handy guide before your visit to this national treasure, and a great souvenir after! Map, fun facts and history of the monument, with wonderful photos. All on a sturdy, laminated card. 5.5" x 8.5" with hole for lanyard. South Dakota is home to an endless supply of American history and Americana. Did you know the world's largest drug store calls Wall, SD home? Or how about the triceratops was one of the state's earliest settlers? What about the prairie the Ingalls family called home? De Smet. Also in South Dakota! The answers to all of these and many more are is the latest Sleeping Bear Press A to Z state exploration - M is for Mount Rushmore: A South Dakota Alphabet. The state's charm and significance in American folklore goes beyond those four presidents' wonderful mugs and it's all captured here in poem and expository text for citizens and tourists of all ages. M is for Mount Rushmore: A South Dakota Alphabet is a welcome addition to the Sleeping Bear Press library and is sure to find a special place in homes, schools and libraries throughout the nation. 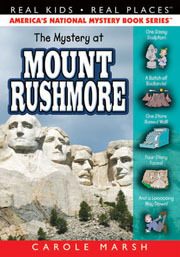 Written and illustrated by the first time pairing of children book pros, author Bill Anderson and artist Cheryl Harness, M is for Mount Rushmore is the tribute to South Dakota readers will love. Well known in South Dakota circles and the country for his Little House work, Bill brings his poignant pen to M is for Mount Rushmore and the verse and text flow with feeling and pride. And breathing life into Mr. Anderson's prose is incredible images of Cheryl Harness. Bringing years of experience and an eye for extraordinary, Cheryl's images capture the grace and wonderment that is South Dakota. Mount Rushmore is the most visited place in the United States. Learn the story about how this wonder of America was made. Mount Rushmore National Memorial, located in western South Dakota, set aside in 1925, preserves the sculpted heads of presidents Washington, Jefferson, Lincoln, and Theodore Roosevelt. The Mount Rushmore National Memorial, a huge sculpture carved into the Black Hills of South Dakota, has become one of America's best loved icons. The images of four of America's greatest presidents are carved into the granite of Mount Rushmore, a task that took 14 years to complete. Peter Nielsen delivers a comprehensive list of facts about Mt. Rushmore, explaining how the project took shape, from the original idea to the final completion. Reading a long book can be overwhelming for a child, but Nielsen gives you the Mount Rushmore story in 57 easy to understand segments. We are sure that that you will be fascinated by the facts about Mount Rushmore in our book and that you will be encouraged to learn more about this majestic American national symbol. Christina, Grant, Mimi and Papa make their way to Mount Rushmore to check out the colossal carving of four presidents? and find a mountain's worth of mystery, history, precocious prairie dogs, quirky clues, befuddling Badlands, and one Crazy Horse! One sassy sculptor! A batch of badlands! One store named Wall! Four story faces! And a Loooooong way down! LOOK what's inside this mystery - people, places, history and more! PLACES: South Dakota: Mount Rushmore National Memorial - Avenue of Flags • Grand View Terrace • Lincoln Borglum Museum • Wall Drug Store, Route 90 • Sioux reservation • Custer State Park, Pierre • Prairie dog town • Peter Norbeck Visitor Center • Crazy Horse Monument and Visitor Center, Custer County. PEOPLE: George Washington • Thomas Jefferson • Abraham Lincoln • Theodore Roosevelt • Gutzon Borglum, Sculptor • Lincoln Borglum, Sculptor • Crazy Horse, Sioux warrior • Henry Standing Bear • Korczak Ziolkowski, sculptor. HISTORY/GEOGRAPHY/SOCIAL STUDIES: Mount Rushmore History and Facts • South Dakota History, Geography, Weather, Animal Life and Plant Life • The Badlands History, Geology: Erosion, Corrosion, Rock minerals, mako sica Animals: coyote • Prairie Products: Wheat and Animals: prairie dogs, bison, burros • Sioux Nation History, Reservation and Traditional Dance: rain dance • The Promise • Proverbs. Like all of Carole Marsh Mysteries, this mystery incorporates history, geography, culture and cliffhanger chapters that will keep kids begging for more! This mystery includes SAT words, educational facts, fun and humor, built-in book club and activities. 1. Download the Carole Marsh Mysteries Real Kids! Real Places! Correlations to Common Core/State Standards HERE. 2. Download the Where Have You Been map HERE. 3. Utilize the Real Kids! Real Places! Common Core State Standards Teacher Resource for classroom discussion questions and activities for ELA grades 2-6. This can be used for all 50 mysteries HERE. 4. Download additional activities including Fact or Fiction, Fascinating Facts, Book Club Discussions and Book Club Activities HERE. 5. Want a sneak peak? Read the first three chapters HERE.